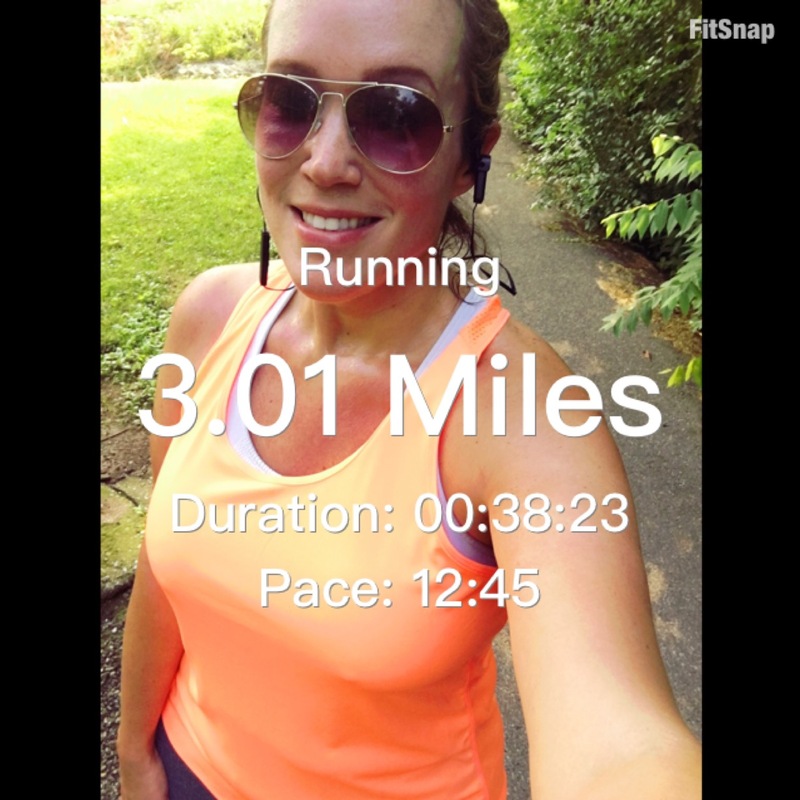 My weekend started out with a short run. It was wonderful. I absolutely cannot wait to do a long run. That'll definitely happen when I get to Chicago! And then I had to meet my twinnie because she had something for me. What was it, you ask? This. 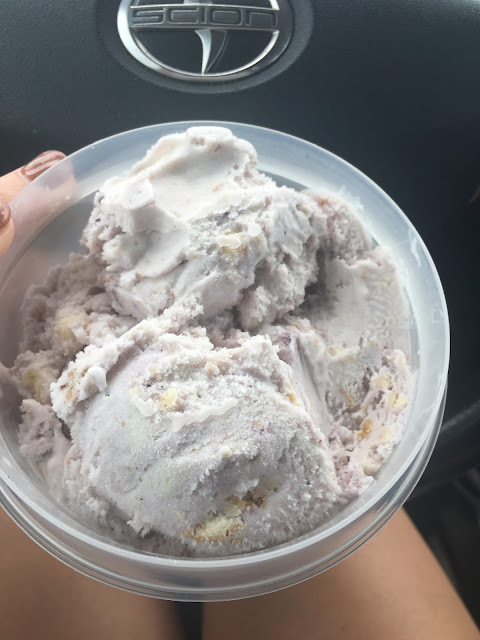 Homemade blueberry cheesecake ice cream. Not only are her cakes out of this world, her ice cream is too. It was pretty amazing. Remember how I mentioned this team that came to Honduras, from KY? They arrived a few days before I left, and they were LIFE to me? Well, they invited me to their church yesterday morning. 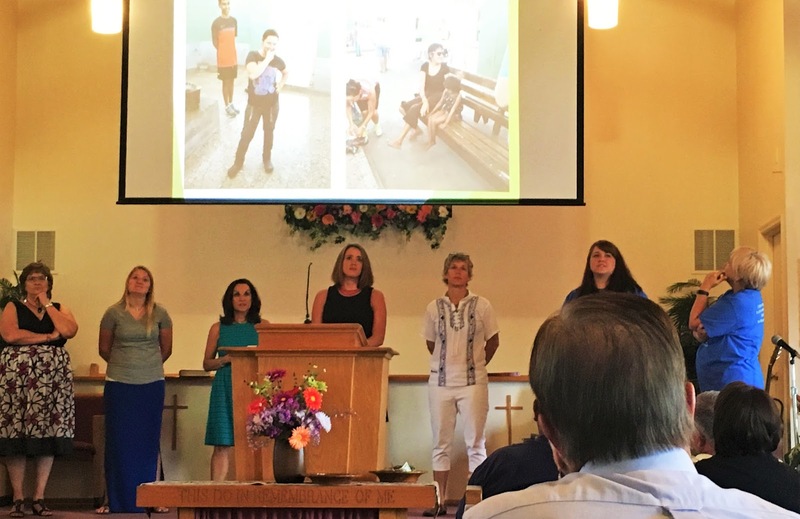 They had a special presentation about their time in Honduras, and wanted me to join them. It was so great seeing them again. Even though we were only together a few days, our experiences bonded us for life. 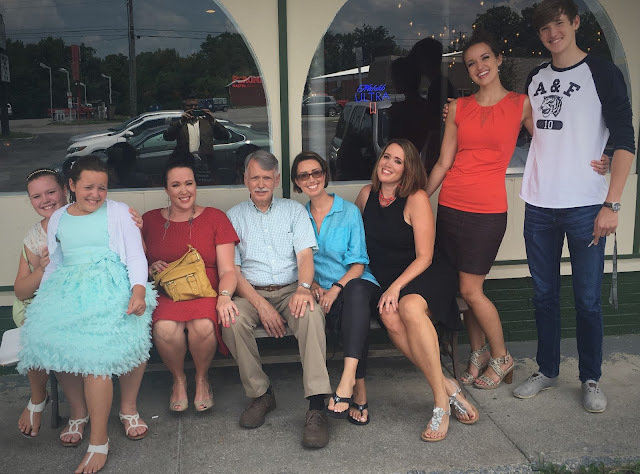 After church we took my Dad out for Father's Day (a week late). Missing my other 4 siblings! Far left is Kristin, my niece. On her lap is Maia, my other niece. Last night I finished packing for Chicago! We're driving there this afternoon. We'll be there for 2 weeks, then come home for the weekend, and so on, for the next 6 weeks. You better believe I will be getting some of this while I'm there! 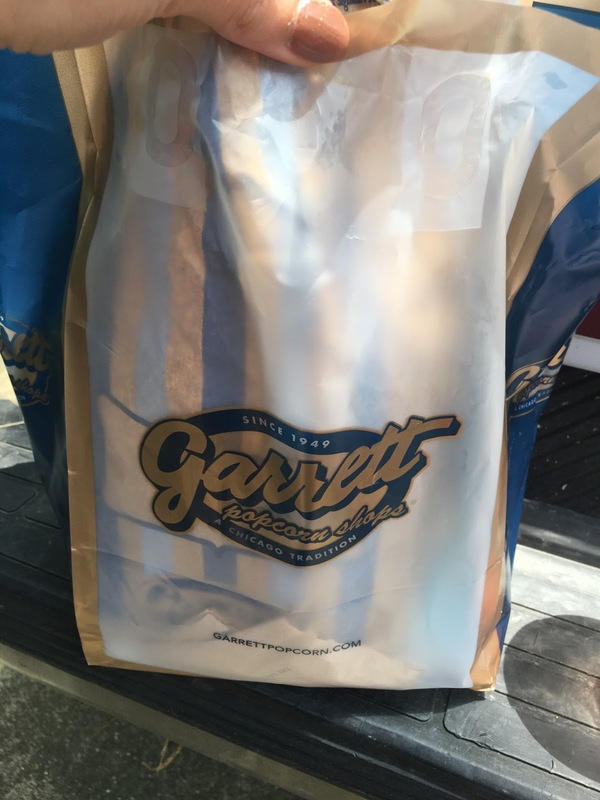 Garrett's popcorn. 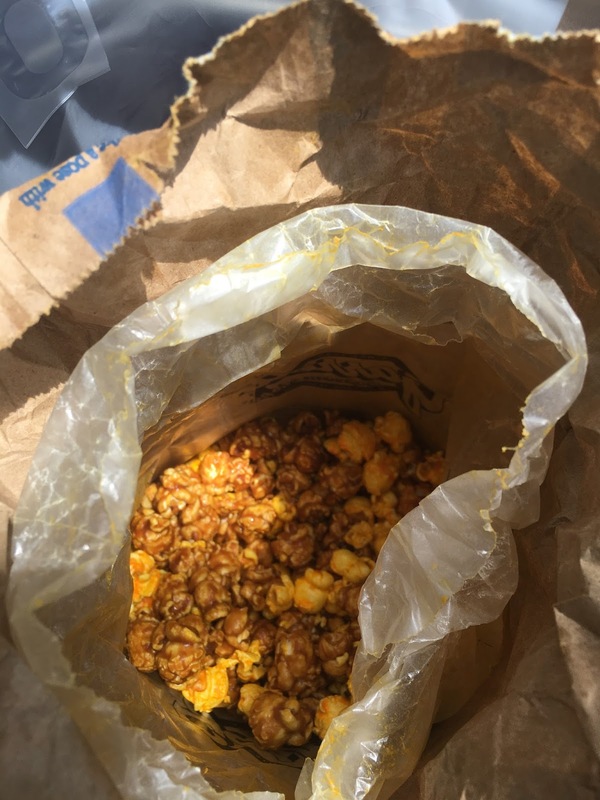 Absolute best popcorn I've ever had in my life. Anyone else want some?? Garrett Popcorn is ALWAYS my stop in Chicago. LOVE the Cashew Crunch. I'll have to try that one! I've just had the Chicago mix. Sounds like a fun girls trip (even though I know the circumstances aren't exactly fun). You've had quite an adventurous summer already! Love the pic of your family. It'll definitely be fun! This is the way I like it, always another adventure. Thanks April! I love you got to go to church & be a part of the presentation. OK - odd question - did you get your shoes recently? I'm looking for some cute silver ones & those are adorable! You have been busy lately! I imagine those friendships you made while in Honduras will last for a while, those experiences have got to be things you'll never forget! I hope you have a fun and safe trip to Chicago!!!! How far is it for you to drive to Chicago that you'll be coming home on weekends?